I bought the Lancome spot eraser (30 ml) from the airport for SG$200. Lately, they launched a BB cream with high SPF as well (SG$60). I was tempted but I didn't get it. I would use the spot eraser on my scars, freckles and uneven skin tones area (around the nose and forehead). And I would just use a small portion each time (coz v expensive mah). Initially within the first week, I think it works quite well. I can see slight lightening of my freckles but recently not much improvements. So I might give my skin a month of rest and then try the spot eraser again. The Laneige star white essence (contains arbutin extracts) - initially when I use this product (within 3 days), my skin peeled badly and I applied only at my neck and up to my jawline. However, somehow it was okay again when I applied a very thin film (one pump). It's non sticky, easily absorbs into my skin, has a mild pleasant fragrance and has arbutin extracts for whitening. I would alternate Laneige with Haba white lady when my skin feels oily. Haba white lady's texture is similar to Haba Lado's. It is a highly concentrated essence of 8% Sasa Kurilensis Water and 6% water soluble vitamin C.
I like the Heliocare gel sunblock (recommended by Chiaberry cotter). It has high spf [nowadays anything more than 40 spf is considered high to me] and is in gel form so it's not sticky / greasy after application. I bought this when I had very bad acne outbreaks few months ago. I feel that this sunblock is better than Avene. Avene's Very High Protection Cream has a stubborn white cast that I need to use makeup remover to remove (if not will result in clogged pores). Hakubi White C. I am on my 8th bottle currently. I stocked this up when I went Japan in Nov 09 (almost half the price here). Results can be seen after consuming the first bottle. In fact, my face was fairer after the 3rd week. Then I realised that my arms got fairer too (into the second bottle). I'm currently taking it for maintenance now (every alternate day consumption). I have previously tried Fancl's Whitening range (white advance drink + white advance pills) but they didn't work for me. 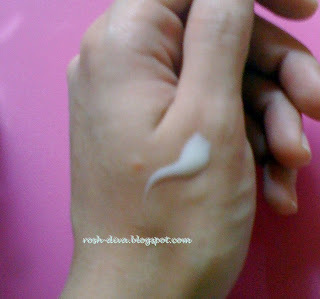 Or should I say, I didn't see results as fast as Hakubi White C.
I got milla seeds from using Loreal's eye cream. So I decided to look for gel instead of cream. I bought this from Bangkok. It has the ability to give a lifted feeling immediately after application.Amazing. Roserity has a nice rose scent. It contains whitening essence extracted from rose water. However, I don't really like the fact that it has a high alcohol content. Garnier UV Lotion has a light lemon scent. The 250 ml only costs SG$8 from Bangkok. I'm not sure if it's sold locally. I have not seen this yet. I have also tried whitening drips with Calvin Chan at Wheelock Place ($250 per drip) but sadly, there are no results. Even Dr Chan says so. He asked me why do you want to be so fair?! Whitening is very important but I think a good sunblock is just if not MORE crucial. I will always be on the lookout for more and better whitening products in the market. I'm a whitening junkie. I want to be as white as a sheet of paper.